PROVENANCE: Collection of Sam Bloomfield. Sotheby's London, 16th November 1971, lot 51. A French Collection (by repute). 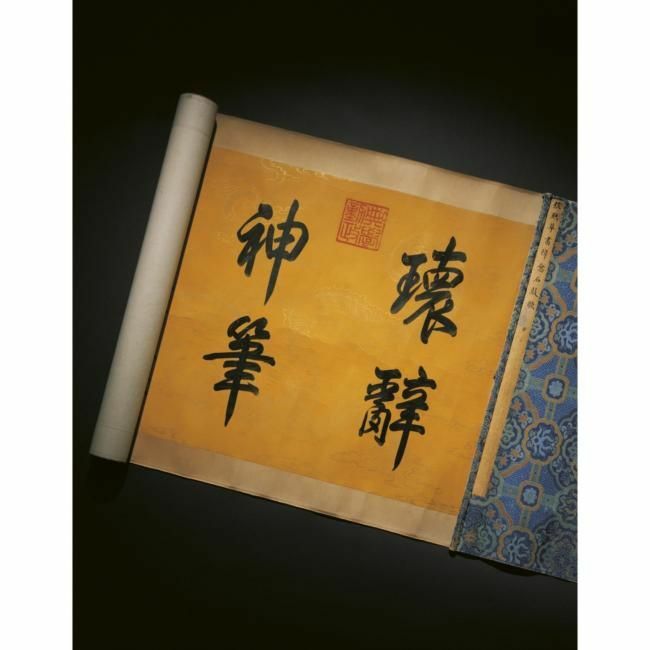 EXHIBITED: The Minor Arts of China III, Spink & Son Ltd., London, 1987, cat. no. 86. NOTE: This exquisitely bejewelled yet understated box belongs to a very special group of wares, possibly presented as tribute item or made on the orders of the Qianlong emperor himself. Gold was considered one of the most auspicious metals, possessing an opulence that catered to the extravagant taste afforded by only the wealthy and powerful. A gold box of related style and possibly by the same hand, similarly inlaid with lapis lazuli bajixiang and turquoise shou characters and geometric bands, in the National Palace Museum, Taipei, is illustrated in Monarchy and its Buddhist Way. Tibetan-Buddhist Ritual Implements in the National Palace Museum, Taipei, 1999, pl. 123. Precious gold containers such as the present box tend to be unique and were individually fashioned by craftsmen working in the Zaobanchu (Palace Workshops), who were responsible for the production of items for the use of the Emperor and his family. 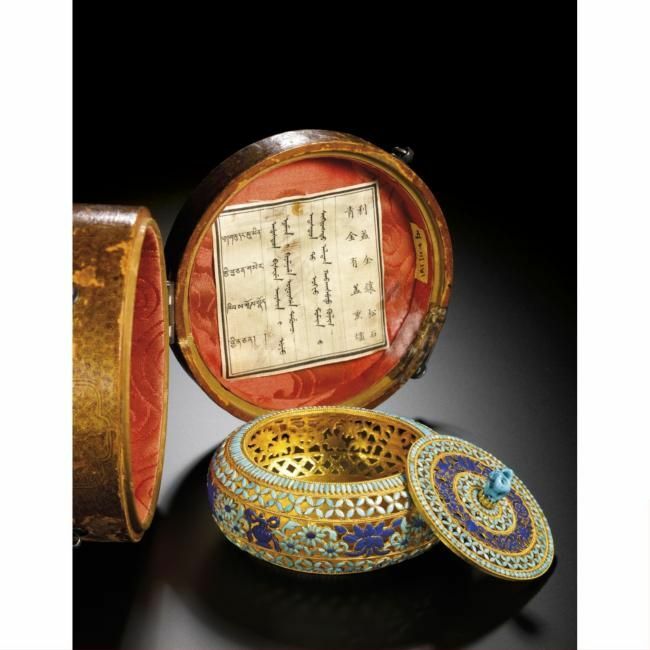 The distinctive decoration of the present box, inspired by Tibetan Buddhist motifs, is outstanding for the carefully composed and inlaid lapis lazuli bajixiang and turquoise floral bands which are expertly encased in an intricate pierced gold structure. The luxurious materials and refinement of the design reflect the Qing dynasty at its economic and political peak which, because of the Qianlong emperor's keen personal interest in the arts, saw a surge of development in artistic innovation. The two bands of the bajixiang reflect the Qianlong emperor's devotion to Tibetan Buddhism. The bajixiang comprise of the Wheel of the Law, conch, canopy, parasol, lotus, vase, twin fish, and the endless knot (see Therese Bartholomew, Hidden Meanings in Chinese Art, Hong Kong, 2006, p. 185 for a discussion of their symbolic meanings). These Eight Buddhist Symbols originated in India and became well-established in Tibetan art, through which they were introduced into China during the Yuan dynasty (1279-1368). 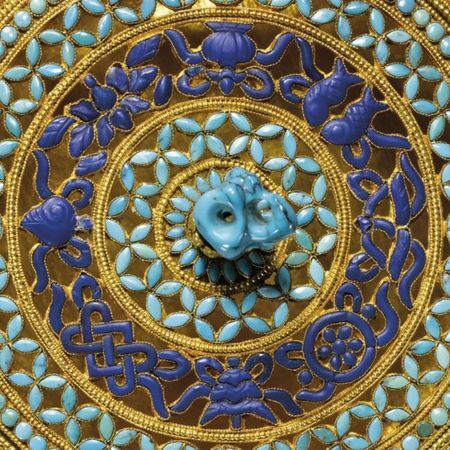 In Buddhism both light and dark blue held symbolic significance and were represented through the use of turquoise and lapis lazuli. Turquoise represents the sky through its colour as well as the earth in its opacity, which symbolises the wisdom of both the earth and sky and the limitless heights of ascension. Traditionally lapis lazuli symbolises purity and rarity, and was valued by Tibetans above gold and other gemstones. Its natural smoothness which allows it to be polished to a high degree, as seen on this box, is associated with having mystic medicinal qualities. 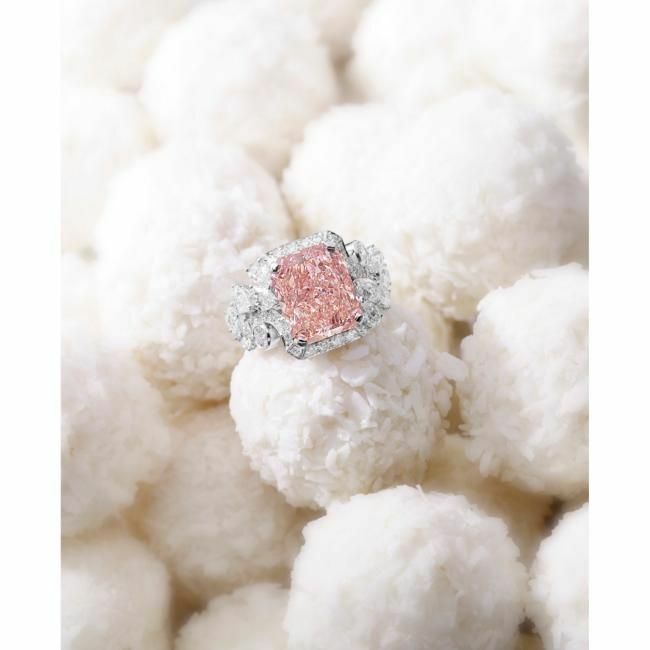 The aura of mystery that surrounded the gemstone may have been due to the virtually inaccessible location of its principal mines in the remote Badakshan region of northeast Afghanistan behind the Hindu Kush. A gold circular box of tiered form, inlaid with the bajixiang in semi-precious stones around the sides and rows of petals on the upper section of the cover, in the National Palace Museum, is published in Monarchy and its Buddhist Way, op. cit., pl. 122. 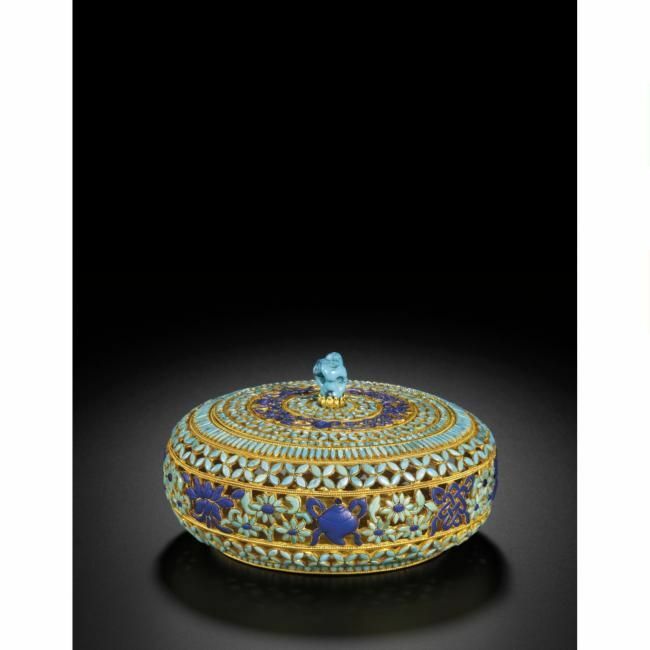 For further examples of unique Qianlong period gold boxes, see a circular example of domed form, decorated with gold branches and turquoise inlaid fruit and leaves, from the Kempe Collection, sold in these rooms, 11th April 2008, lot 2316; an octagonal box pierced in the repoussé technique with flower scrolls and inlaid with various gems, in the Palace Museum, Beijing, included in Zhongguo jinyin boli falangqi quanji, vol. 3, Shijiazhuang, 2002, pl. 306; and three boxes of irregular forms inlaid with precious stones on a gold filigree ground, illustrated in Masterpieces of Chinese Miniature Crafts in the National Palace Museum, Taipei, 1971, pl. 41. Commentaires sur A superbly embellished and very rare reticulated gold censer and cover. Qing dynasty, Qianlong period.